"You may brush shoulders with college boys and boys who don't go to college in the Uptown district..."
Editor's note: What a gem of a find! The excerpts below are from "Dining in Chicago" by John Drury. Six miles north of the Loop lies Uptown, a sort of miniature Loop. Tall terra cotta office buildings, hotels, business houses, movie palaces, amusement centers and restaurants, as well as orange huts, photomatons, chop suey parlors and $1.88 women's hat shops, abound in the district and give it a sort of gay carnival air. It is quite definitely a night life pleasure area and serves the entire north side and, more particularly, the romming house and apartment hotel district immediately surrounding it. The beaches of Lake Michigan are at its feet; street-cars and elevated trains lead to it; and at night it is the Great White Way of the north side. The best waffles in town. This shop has been here for many years, and people come from all over the city to this famed uptown eating establishment—especially for late supper or a snack in the wee small hours. Other dishes are exceptionally good here, too. Ashton Stevens drops into this place frequently during the spring months for the delightful asparagus tips served at the Sally board. 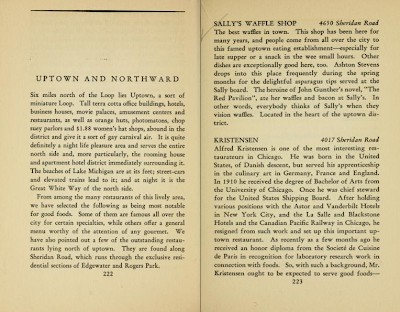 The heroine of John Gunther's novel, "The Red Pavilion," ate her waffles and bacon at Sally's. In other words, everybody thinks of Sally when they vision waffles. Located in the heart of the uptown district. Alfred Kristensen is one of the most interesting restaurateurs in Chicago. He was born in the United States, of Danish descent, but served his apprenticeship in the culinary art in Germany, France, and England. In 1910 he received the degree of Bachelor of Arts from the University of Chicago. Once he was chief steward for the United States Shipping Board. After holding various positions with the Astor and Vanderbilt Hotels in New York City, and the La Salle and Blacksone Hotels and the Canadian Pacific Railway in Chicago, he resigned from such work and set up this important uptown restaurant. As recently as a few months ago he received an honor diploma from the Societe de Cuisine de Paris in recognition for laboratory research work in connection with foods. So, with such a background, Mr. Kristensen ought to be expected to serve good foods—and he does. He has no specialties on his menu since every item on it is a specialty. Worth trying. 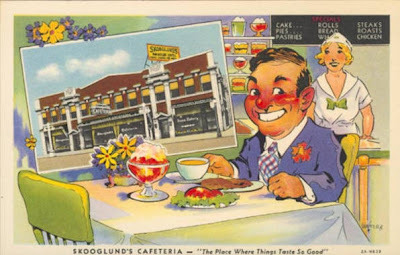 Although a cafeteria, Skooglund's is an uptown culinary landmark. The cuisine is both Swedish and American and you can get a large assortment of food items—baked goods, vegetables, salads, meats, and fish. Here you can also eat the delicious Dundee cake and those savory little wafer pancakes that the house specializes in. The Swedish hors d'oeuvres alone would make a meal. A bakery and delicatessen is conducted in connection with the cafeteria. The Marine Dining Room is the principal dine-and-dance center of the uptown area. Here, in a large and attractively decorated room, located in a hotel which stands right on the shores of Lake Michigan, you may dance every night except Sunday night. Special nights are featured during the week—Monday is Celebrity Night, when theatrical stars are usually present; Friday is Fraternity Night, with plenty of frat members at the tables, as well as co-eds; and Saturday is Formal Night, a time of starched linen and red velvet wraps. Always there is plenty of fun, the music is lively, and the walks along the terrance between dances are pleasurable and refreshing. The Marine Dining Room serves luncheon, afternoon tea, dinner, and late supper. 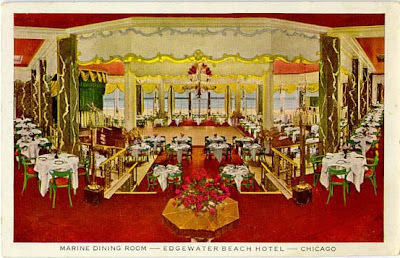 Similar service is rendered in the Grill, another dining room of the Edgewater Beach. 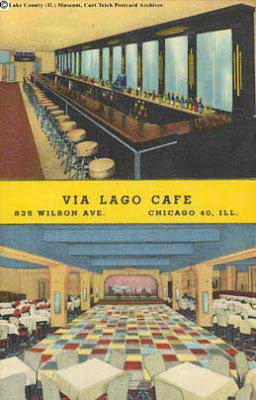 A high-toned and well-known eating parlor, located in the high-toned and well-known part of Chicago. The mansions of the wealthy are on all sides and directly across the street are the grounds and low builings of the Saddle and Cycle Club, one of the most fashionable and exclusive clubs in Chicago. Alice Baum offers genuine home cooking, with plentiful portions, and her seasonings are notable. The room is tastefully decorated and the atmostphere is restful and dignified. Table d'hote luncheons are 65 cents, and similar dinners are $1.00 and $1.50. Where the uptown sun-dodgers go. Texas Guinan used to have this place. Diverting revues, plenty of fun, and "hot music." Jack Huff, who conducts the Lincoln Tavern outside the city limits during the summertime, is host. This is a great find, I wish could try those restaurants from back in the day. Especially Sally's Waffle Shop. That sounds yummy! Here are a few more memories from the 60s. I lived at 4519 N. Sheridan, one block from the hotel. On the corner of Windsor and Sheridan was a tavern that was the unofficial "depot" of the Sheridan Plaza Bus Lines, a racetrack shuttle line, that parked its buses in the gas station at Sunnyside and Sheridan. I worked there for several years, and at the newsstand at Wilson and Sheridan in front of the Rexall drug store. Anyone remember Bill (day man) and Casey (night man)? If you don't believe it's a small world...many years later, the man who became my father-in-law in 1979 told me he was a bartender at the Backstage in the 50s. I don't remember the barbershop in the SP Hotel, but the shop in the Lakeside hotel, across the street from the Backstage, was run by Herman. I've got a ton more memories. Anyone interested? We get between 400 and a thousand hits a day--not bad for a history blog. :-) There's definitely an interest in memories of Uptown. I recall a cafeteria across from the Wilson Ave Mens Club a very cheap hotel on Wilson, there was also a day labor agency just down the street from this hotel on the same side of the street. The thing I recall about the cafeteria is that it was not that expensive and food was great for the price. I was down and out at the time and I also recall being given money by someone who worked there so I could eat. Looking for information about Harding's Resturants. Jim, Could it have been Thompson's Cafeteria? It was on Broadway and Wilson. So good to hear this awesome history.